Most people think of pretzels, chips or cookies when they hear the word snack. But snacks can be a really important part of a weight loss plan IF you make the right choices. Though an occasional sweet or salty treat can fit into any meal plan, it’s important to “snack smart” most of the time. I work in an office most days and always pack a nutritious snack or two (and my lunch) to have on hand. Though you can manage without a fridge, it is easier (more convenient) to “snack healthy” at work if you there is a fridge you can use to store some perishables. My typical go-to foods include yogurt, cottage cheese, low-fat cheese, hummus, fruit, raw veggies, natural peanut butter, kashi TLC bars and nuts, but I have also been known to snack on half a sandwich or a bowl of soup! Here, I have included some nutritious, portable snack ideas, calories included. Just remember you may need to reduce calories at meals to accommodate extra snack calories. And be sure to have an insulated bag for toting around your snack, especially if it needs to be kept cold and you don’t have access to a fridge. Apples are crunchy and naturally sweet. They also have soluble fiber, the type of fiber good for lowering blood sugar and cholesterol. Pair with nuts, such as almonds, and you add a good dose of healthy fat and a little protein. Here, any fruit and small handful of nuts will do! Aside being fun to eat, pistachios are one of the lowest calorie, lowest fat nuts, offering the most nuts per serving. 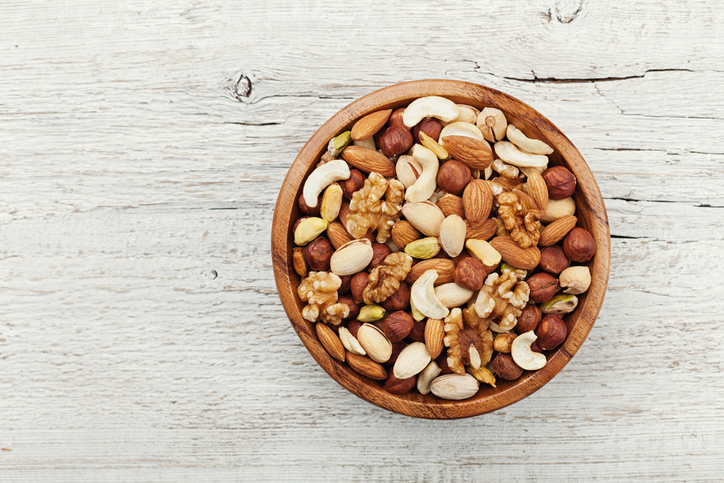 They also have the highest potassium content of any nut, and offer 3 grams of fiber and 5 grams of protein per ounce. Cottage cheese is a great source of protein, and has 15 grams in just ½ a cup, the equivalent of 2 ounces of meat. Mixing with fresh fruit adds a natural sweetness. Sprinkle with cinnamon for extra flavor. To make this portable, buy mini cottage cheeses (4-oz packages) or just put ½ a cup in a tupperware with berries and tote along. Nothing could be easier than spreading nut butter on a rice cake. Sunflower butter, made from sunflower seeds, is a welcome alternative to peanut butter. You can also try almond, cashew or walnut butter for a change of pace. For added sweetness, top with 4-5 thin slices of banana (20 calories). Place in a to-go baggie to make it portable. Greek yogurt, which has much of the water removed, is a much creamier version of regular plain yogurt. Since most yogurts come packed with added sugar, go for plain, and just add fresh fruit and a touch (tsp or two) of honey or sugar. Pack in a tupperware container if you need it “to go.” Another yogurt trick I use is to buy brands with fruit on the bottom. I then just eat the white part and leave the goopy fruit/sugar/extra calories at the bottom. The top is surprisingly sweet (much more so than plain yogurt). Eat that as is or add fruit and nuts to it. Hardboiled eggs make great snacks as they are so portable. Just peel and eat, with an added dash of salt and pepper. At just 70-80 calories per egg, they are a calorie-conscious snack. When pairing with crackers, check serving size for number of calories per cracker, which varies with each brand. Alternatively, you could buy reduced fat cheese that is individually packed in one ounce servings. These are great for “on the go” snacking and can also be paired with crackers or fruit. Hummus, made from crushed chick peas, sesame seeds, lemon juice and a touch of olive oil, makes a great dip for raw veggies. It also delivers 4 grams each of fiber and protein per ¼ cup serving. Pack hummus in small container and put veggies in baggie. These are one of my favorite “granola” bars. They are low in sugar, high in fiber and protein. They come in lots of flavors, and are very tasty. I like the chewy versions versus the crunchy ones.